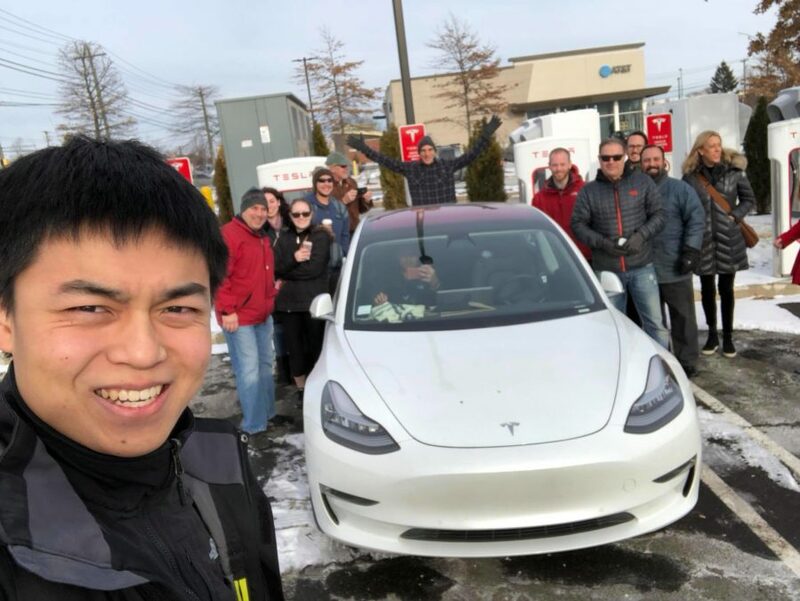 You You Xue poses for a photo with his Tesla Model 3 and residents of Milford, Conn., earlier this year. Xue drove the car on a 13,000-mile trip across the country this year, reporting on its performance via Facebook posts. As You You Xue completed a whirlwind cross-country trip in his brand-new Tesla Model 3 earlier this year, the 20-year-old Californian racked up some impressive statistics. In 21 days, he drove about 13,000 miles, through 36 states and three Canadian provinces. He gave test drives to around 450 people and let thousands of others ride along, getting their first taste of Tesla’s newest electric car. But along the journey – which drew a fan following on Facebook – Xue also had problems with the Autopilot feature, which since has come under scrutiny because of a fatal crash in March. The Autopilot system seemed to have trouble getting calibrated, he said, and improved as the trip went on. Tesla responded to Reveal’s inquiries with its standard explanation about the technology – that drivers must be alert and engaged at all times and that they’re reminded of that before going into partial self-driving mode. The company also accused the National Transportation Safety Board, which is investigating the accident, of being “more concerned with press headlines than actually promoting safety.” The safety board removed Tesla as a participant in the investigation for disclosing sensitive information, which Tesla disputes. Tesla is also under fire for worker safety problems in its Fremont, California, factory. It faces a government probe following a Reveal investigation that found the company undercounted injuries and disregarded the warnings of its own former safety experts. Tesla claims Autopilot saves lives. It says a government study found that an early version of the technology reduced crash rates by 40 percent, though that statistic has its doubters. In response to Reveal, Tesla noted that its owner’s manuals repeatedly warn drivers to keep their eyes on the road even when the technology is driving for them. But what if the driver falls asleep? “I’ll confess that I have fallen asleep on the road at least 15 to 25 times on the journey,” Xue said. When that happened, Autopilot saved the day, he said. The system regularly asks the driver to touch the steering wheel, he said, and if there’s no response, the car blares an alarm to wake up the driver and slows the car to a stop. “It would start beeping very loudly, and that sound is going to be in my nightmares for the next few weeks,” he said. With chronic production delays, there’s a lot of speculation about whether the Model 3, Tesla’s first mass-market car, is really ready for the masses. But Xue, who strongly believes in electric vehicles, said he wonders whether the masses are ready for the Model 3. Currently, most of the people who can get their hands on a Model 3 are preferred customers such as Xue, who already own other Tesla vehicles and are used to the technology. Clarification: This story has been updated to make it clear that Tesla’s Autopilot feature is a partial self-driving technology, as opposed to fully automated. KQED reporter Alyssa Jeong Perry contributed to this story.